Will American’s 777-300ER have a new logo for the inaugural flight? American is set to introduce their first Boeing 777-300ER into service with an inaugural flight from DFW to Sao Paulo on January 31. They’ve already taken delivery of two 777-300 aircraft and another is soon to be delivered. This weekend American flew their first 77W, N717AN, to Miami and plane spotters were on hand to capture its arrival: it was still painted gray with a white tail and without a logo. American’s second 77W, N718AN, was parked outside a hanger at DFW as recently as January 7. I was at the airport on Saturday and didn’t see it, and according to FlightAware it hasn’t gone anywhere. I assume it’s inside one of the maintanence hangers. 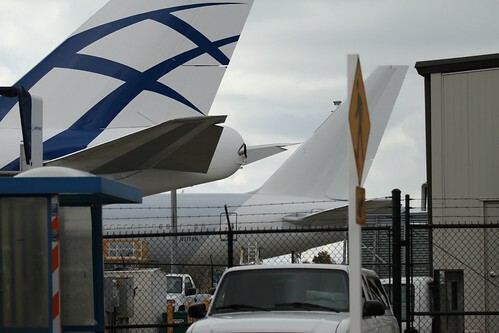 American’s third 777-300ER, N719AN, is still at the Boeing factory. I heard from a credible source that American’s fourth 777-300ER, I’m assuming it will be aircraft N720AN, will be the first to be fully painted in the new livery. So I wonder if the first three are going to sport an interim livery or if they will be have the traditional AA logo painted ont he white tail? I wonder how much longer we’ll have to wait for the new logo? Don’t forget that The Frugal Travel Guy’s Monday Deal of the Day is sponsored by AAdvantage. Share you best American Airlines or AAdvantage related travel tip for a chance to win 2,500 AAdvantage Miles!